As scientists our most important skill is to be able to observe things clearly. 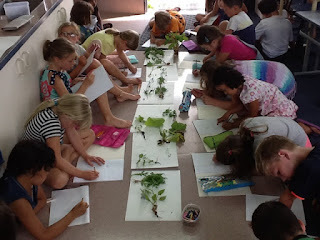 Today we made detailed drawings of the weeds we found in the garden yesterday. It made us realise how hard the artists, who went with explorers, had to work to bring home all the information they discovered on their travels. Obsrve closely said Sam...look at it and see all the right shapes and collect details. Wow, I like all of your comments about observational drawing! This is one of my favourite type of drawing. It takes practice to look at something and copy it. Looking forward to seeing your observational drawings!